Email marketing is an effective tool for nonprofits. While many might try to argue that email marketing is dead, this couldn’t be further from the truth. As a nonprofit, you need a way to create real-life relationships with your donors and to build a larger reach with your audience. Email is an effective way to not only develop a loyal donor base and drive more donations but to also spread awareness. Many of these lifecycle campaigns can even be automated to drive donations and support without ongoing attention. In this guide, we’ll address many strategies and examples you can use in 2019 to further your mission for good. Nobody wants to read an email that feels like it’s written by a machine. In this day and age, it’s not unlikely that emails are autogenerated by artificial intelligence and other machine learning, so it’s more important than ever to be authentic and personal with your content as a nonprofit. To start, use a client management tool to keep track of donors and those who sign up for more information. Segment these lists by interests. Some might be interested in learning more while others might have already made a donation in the past. From there, you’re equipped to send highly personalized, authentic emails customized to wherever your supporters are in their journey. 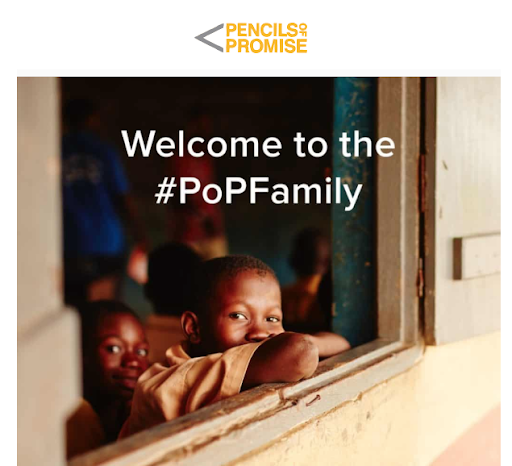 Pencils for Promise, for example, welcomes new donors with a friendly email. Your signup form should be the easiest thing on your website to find. Generating more email signups isn’t hard at all for nonprofits. Nonprofit email lists grow an average of 10% each year, a crazy statistic in the digital marketing world! Remember, it’s about quality over quantity. 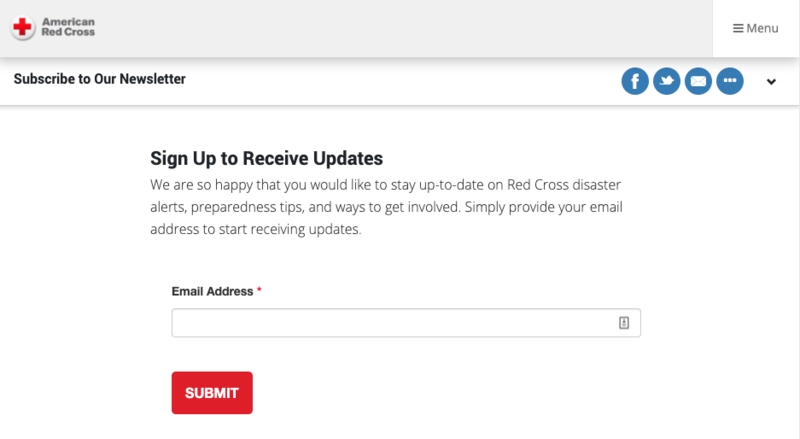 The American Red Cross makes it simple for visitors to sign up for newsletters and updates. Users only need to input their email to get started, though there’s also space to add additional information. The simpler the process, the more conversions. As a nonprofit, it’s tempting to share every possible update. You’re grateful to your donors, and you want them to feel involved every step of the way. You need a compelling message that matches your compelling cause. Event Invitations – Do you have an event coming up? If so, invite your donors to join you. From fundraising events to opening ceremonies, these are a great chance to get people involved. Newsletters – Remember to keep these newsletters targeted and valuable. Include statistics about past donations as well as information about your organization’s success. Donation Requests – Of course, you’ll want to remind your donors to make an additional donation. These are more successful when shown to users who have already demonstrated an interest in similar campaigns. Thank you emails – Last but not least, send follow-up emails thanking your donors and supporters for their ongoing contributions. 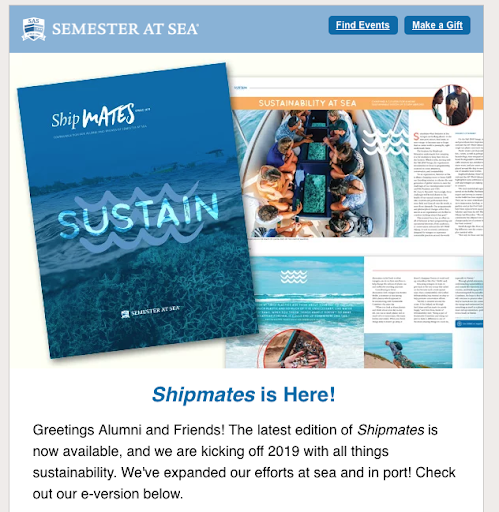 Below, Semester at Sea, a nonprofit that supports a global classroom, encourages past donors to download their latest version of their sustainability guide. This guide shows how far they’ve come to expand their sustainability both at sea and in port. The guide is available for free to past donors via email. Since you likely don’t have time to send this many emails on a regular basis, why not automate as many as possible. While some will depend on upcoming events and donation requests, email marketing tools can handle much of the automation in just a few clicks. Start with the easiest emails to automate which are the welcome, thank you, and follow up emails. For the welcome email, send an email immediately after someone signs up for the email list. This can be as simple as introducing your nonprofit and what it is you do. Next, send a thank you email immediately after someone makes a donation. This automatic praise and thanks will show your organization cares about even the smallest contributions. Finally, automate a series of follow up emails on a regular basis to retain your supporters, whether you send a donation reminder or identify new ways to give. Again, see how Semester at Sea retains past donors with regular, planned days of giving throughout the year. 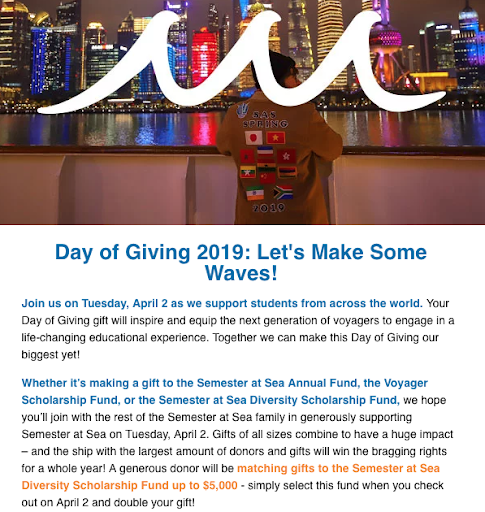 Through these emails, the organization encourages everyone to come together to give whatever they can to the next generation of shipboard education. These strategies above will guarantee not only that you gain more email subscribers for your organization, but that you keep these supporters giving again and again. Email doesn’t have to be complicated. In fact, as you can see about, much of it can be automated to lessen your own workload. As long as you’re creating value, sharing your story, and staying authentic, you’re doing something right. Nonprofits have a cause to share with the world. Emails help you tell your story directly and on a personal level. Share your thoughts about effective lifecycle email marketing for your nonprofit in the comment section below. I’m really looking forward to reading your comments.